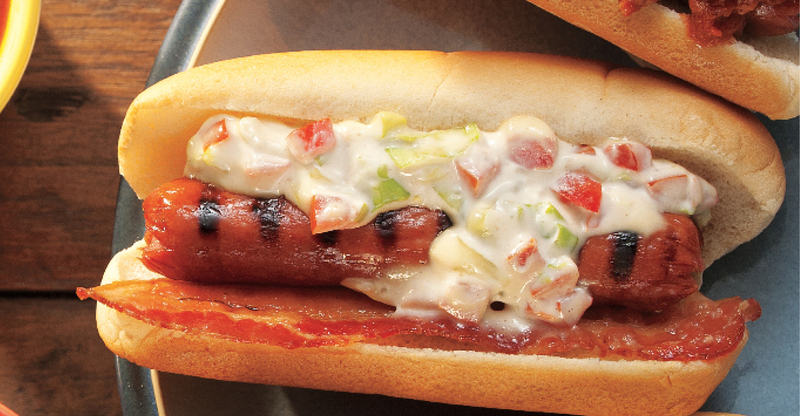 These BLT hot dogs are topped with shredded lettuce, fresh Roma tomatoes, mayo, a hint of Dijon mustard with Italian dressing and a slice of crispy bacon! In medium bowl, stir mayonnaise, Dijon mustard and Italian dressing until well combined. Stir in tomatoes and lettuce. Cook bacon in microwave oven for 45 seconds or until heated through. Place 1 grilled hot dog and 1 slice of bacon in each bun. Top with ¼ cup tomato mixture. This Creamy Italian Pasta Salad recipe from Schnucks is an easy crowd pleaser. The original Coney dog features an all-beef hot dog topped with a bean-less meat chili, diced onions and a strip of yellow mustard.